Sodium is a mineral that is required to maintain good health, though most of us eat far more than our bodies need. Almost all fresh foods have small amounts of naturally occurring sodium. In contrast, processed foods are typically much higher in sodium because salt is often added during the processing and preparation of foods. In fact, processed foods typically make up to 75% of our sodium intake! Pizza, deli meats, soups, snack foods (chips, pretzels, and crackers), cheeses, sauces, and breads are some of the foods highest in sodium that teens typically eat. Once in a while, it’s okay to eat fast food, but remember it tends to be very high in salt, so try not to eat it too often. When ordering at fast food restaurants, choose salads or foods that are grilled, broiled, or steamed rather than fried, cured, or smoked foods. Limit high-salt toppings such as ketchup, mustard, BBQ sauce, and pickles. 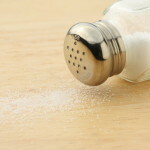 Ask for your dish to be prepared without extra salt. You can also look up the nutrition facts on almost all fast food menu items online. Check out the menu ahead of time so you know which options have the lowest amount of salt.